Over the summer I worked with Professor Ray Rogers on microfossil bone beds from central Montana. During the previous school year, I took two classes with Professor Rogers in which I learned about paleobiology and sedimentology. Just a few weeks into my Paleobiology class, I knew I wanted to work with Ray, so when he offered me the opportunity to conduct research with him over the summer, I was ecstatic. For the first part of the summer, I sieved sandstones and mudstones from the Judith River Formation of Montana—a 75-million-year-old rock formation—and looked for fossils in the particles that remained in the sieves. I counted, weighed, and identified fossils from fish, crocodiles, dinosaurs and more under a microscope. 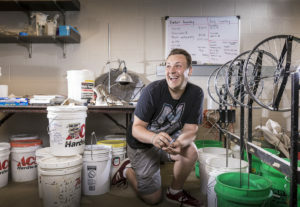 In all, I sorted through almost 10,000 fossils and 50 kilograms of sediment. During the second part of the summer, I went to Montana to collect microfossils from known bone beds and to prospect for new beds. A group of four students and three professors went to the Upper Missouri River Breaks National Monument, which is located along the Missouri River in central Montana. In the field, we found many exciting fossils, including three leg bones of a hadrosaur (duck-billed dinosaur) and a beautifully preserved tooth of a relative of T-Rex. I found the tooth while exploring some little bone fragments on the ground surface, and it ended up being almost two inches long! I also collected samples that included thousands of shark teeth, fish vertebrae, and large marine reptile bones from plesiosaurs. When I return from my study abroad experience in Italy, I will use those samples for my senior honors thesis. Doing research at Mac during the summer was an amazing experience that I would recommend for anyone interested in research and science in general. I learned about fieldwork and collecting samples, while studying what I love—paleontology. This experience convinced me that I want to go to grad school to continue my education. Research was supported by the David B. Jones Foundation.